This week continues to deliver a messy forecast for Houston, as a cold front pushes through the region today, and the potential for some more thunderstorms later this afternoon and evening when upper level winds favor the development of some fast-moving showers. This rainy pattern continues through Sunday, after which time we might finally see some clearing skies with a significant cooldown. The aforementioned cold front is hung up in the city, such that temperatures in The Woodlands, Tomball, and Katy are only in the upper 40s this morning, while areas like League City, Seabrook, and Clear Lake are in the mid-60s with high humidity and fog. This front should slowly slog down toward the coast this morning, helping to clear fog and dropping temperatures. Alas, this is a shallow front, so we’ll still see mostly cloudy skies. Moreover, a feature known as a jet streak, which is part of the jet stream where there are stronger winds, will transition over the region later this afternoon. This lift will bring an elevated risk of showers and thunderstorms from around noon to sunset. Accumulations likely will be only a few tenths of an inch of rain, but some small hail is possible. I’d expect any storms that develop this afternoon to hopefully die down around 6pm, so rain chances going into the rodeo will likely be only around 20 percent. But it will be chilly, with temperatures in the low 50s, and a moderate northerly breeze. Post-show temperatures will probably be around 50 degrees, with only a 10 percent chance of rain. As Thursday’s front, which should stall just offshore, moves back inland we’ll see temperatures quickly recover to around 70 degrees on Friday, with fog in the morning and humidity. At least rainfall chances are relatively low, probably below 20 percent. 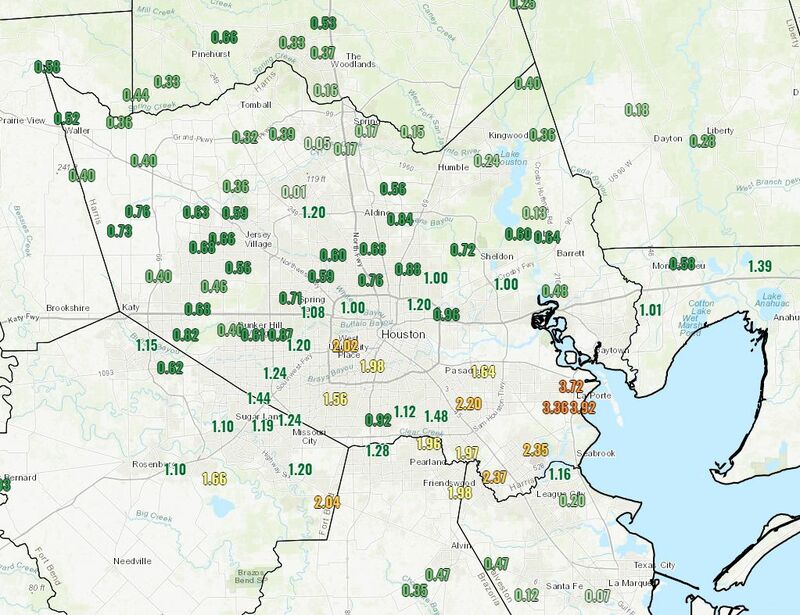 Storms on Tuesday afternoon and evening proved more intense than anticipated, with some areas near Rosenberg, West University Place, Pearland, Friendswood, and Clear Lake seeing 2 inches of rain or more, and Deer Park and La Porte seeing 3 to 4 inches of rain. Fortunately, this threat of heavier rain appears to have passed—although daily precipitation chances are likely to remain with us through Sunday. It’s a messy forecast, so let’s jump into it. The main problem this morning is fog, as warm air in the 60s moves over cooler water. A dense fog advisory is in effect until 10am this morning so take some extra care for your commute, or trips around town. Today will be fairly warm, with highs in the mid-70s under mostly cloudy skies. We probably will see some scattered showers develop this afternoon, although I don’t expect them to be nearly so organized or as intense as those on Tuesday evening. Temperatures will still be in the low 70s at around 6pm today, and we cannot rule out some showers over the central Houston region. I’d put the chances of light rain near NRG Stadium at about 30 percent going into the show. Conditions will still be muggy after the concert, but rain chances should fall down to around 10 percent. The will-it or won’t-it make it cold front appears likely to stall somewhere over the Houston metro area on Thursday. Of this much, we can be sure: a cold front will push into the northern edges of the metro area on Thursday morning. After this, the most likely scenario is that the front stalls somewhere along Highway 59, or perhaps a bit closer to the coast. Your local temperature, humidity, and rain chances are all going to vary Thursday depending on how far the front makes it (for example, the range of possibilities for afternoon temperatures at Bush Intercontinental Airport in the European ensemble model range from the upper 50s to 75 degrees). So our official forecast is ¯\_(ツ)_/¯. It’s a cloudy, misty morning generally in the 50s across Houston this morning, and overall this will be a wet day. Most of the rest of the week, and the weekend, will also be gray although rain chances probably won’t be quite so high as today. If you’re wondering about seeing some sunshine, there’s a bit of hope for Thursday, but Friday is probably the day you’re looking for. The combination of a warm front moving onshore, nearby low pressure, and increasing atmospheric moisture levels will lead to a day of widespread showers and perhaps a few thunderstorms. As we saw on Monday, there is a chance of seeing some small, likely pea-sized hail in the strongest thunderstorms. Most of the region will likely see 0.25 to 0.50 inches of rain as highs rise into the mid-60s under gray skies. Will it be humid? Oh yes, it will be humid. 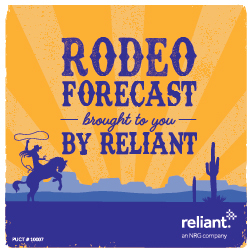 On Monday, we saw rain showers diminish as the gates opened at 6pm for NRG Stadium and the Houston’s rodeo. I’m not sure that will happen tonight. It does appear as though the rain will lift north and east of Houston this evening, away from the city, but it’s not clear whether that will happen by sunset, or a little bit after. We’ll therefore carry rain chances of about 40 percent going into the show, and 20 percent after. Temperatures will be in the low 60s at 6pm, and largely unchanged later on. With dewpoints nearly the same, expect 100 percent humidity. 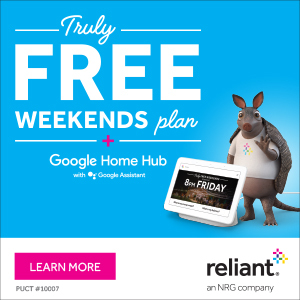 By the way, at the end of today’s post, be sure and check out a special message from Reliant about it’s rodeo-related activities. Rain chances will be lower on Wednesday, perhaps in the 20 to 30 percent range, as the atmosphere calms down a little bit. Temperatures will reach the 70s, as warmer air moves into the region from the south and southwest, and Wednesday night (mostly if not completely dry) will only fall into the 60s. 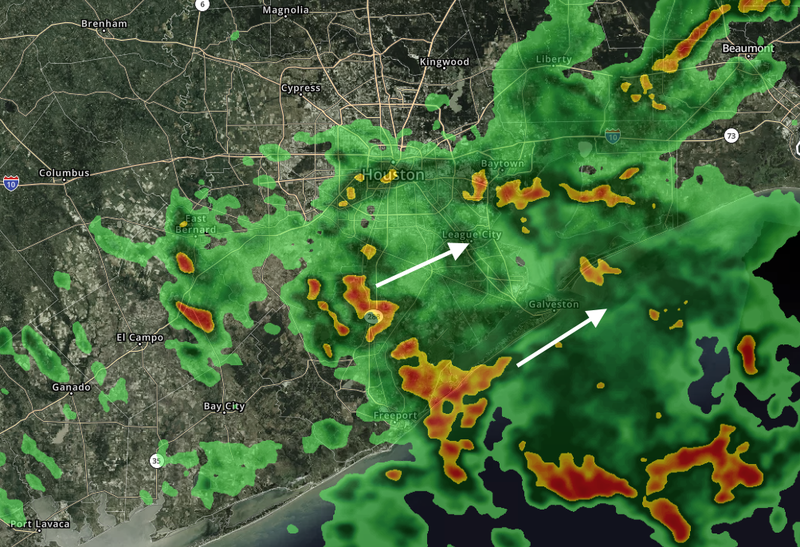 We knew rain and scattered storms were returning to Houston, but frankly we didn’t think they’d come this soon. However, a relatively localized feature, a kink in the atmosphere, is moving up the Texas coast today and it’s driving the development of some storms primarily to the south and southeast of Houston. A few areas are seeing pea and dime-sized hail as a result. The regional models we use to predict the evolution of these kinds of storms haven’t done a great job of handling their development today, but generally I think they’re going to wane by or before sunset. The overall forecast remains the same through mid-week, with widespread showers late Monday night and Tuesday producing perhaps 0.25 to 0.5 inch of rain, and more scattered showers on Wednesday. Some additional hail will be possible with the stronger thunderstorms on Tuesday.